The 29th annual Victoria Tourism Awards ceremony took place on Monday 11th November with over 90 entrants across 32 categories for this year’s awards, with submissions reaching a very high standard. Congratulations to the Ecotourism Australia certified tourism operators who have received one of the awards by demonstrating business excellence and best practice. For more information about these certified experiences, visit our website. Last week saw the announcement of the 2013 Queensland Tourism Awards and Ecotourism Australia was proud to see a high number of certified operators taking home awards across a wide range of categories. Congratulations to all our certified award winners, keep up the fantastic work! South Australia Tourism Industry Council has announced the winners of the 2013 South Australian Tourism Awards. Ecotoruism Australia is happy to see 15 of our certified operators among the award winners, a number of whom took home multiple awards! Congratulations to all of our certified award winners, keep up the fantastic work! The 2013 Global Eco Asia-Pacific Conference was held last week in Noosa on the 18th and 19th November. It concluded with a series of additional forums and workshops on the Wednesday where delegates took a ‘hands on’ approach to the issues. This year’s Global Eco Conference focused on the megatrends that will impact the tourism industry over the next 20 years. Six of the seven CSIRO’s megatrends were covered: Orient Express; A Natural Advantage; Great Expectations; Bolts from the Blue; Digital Whispers; and On the Move. For more information about the megatrends visit http://www.globaleco.com.au/conference-theme.php. The conference’s purposes were to equip destinations, organisations and operators with a practical plan to take away from the conference that guides their organisation in its response to Asian Pacific megatrends. It provides delegates with a greater understanding of the challenges and opportunities these megatrends will bring and demonstrates how the World’s leading operators are already responding to these megatrends – through innovative products, services and distribution techniques. “We have received excellent feedback from delegates and the quality of speakers was, again this year, outstanding”, said Rod Hillman, Chief Executive of Ecotourism Australia. Keynote speakers included Costas Christ, Editor at Large at National Geographic Traveller; Sam Friend, Former General Manager and CFO at Wotif.com; Keith Sproule, Tourism Advisor at WWF-Namibia; and Mariglo Laririt, Director of Sustainability at El Nido Resorts, Philippines. Over 20 speakers presented their insights over the two days, with the last day dedicated to the forums and workshops covering Strategic Partnerships; Indigenous Cultural Tourism; Marketing in the 21st Century; Tourism in Protected Areas; Operators’ Marketplace; and Geotourism. “We would like to thank everyone who participated over the three days and in particular to the conference partners and sponsors”, said Mr Hillman. This year, the conference was supported by: Queensland Government, Tourism & Events Queensland, Tourism Noosa, the Great Barrier Reef Marine Park Authority, the University of Queensland, Eumundi Markets, Noosa Biosphere, Wet Tropics Management Authority, Queensland Tourism Industry Council, National Indigenous Times, the Campervan & Motorhome Club of Australia and Outrigger Little Hastings Street Resort and Spa. The Excellence and Innovation Awards were announced at the Gala Dinner on Monday 18 November. More information about the awards is available at https://eco-bytes.com/2013/11/19/2013-ecotourism-australia-awards-announced/. JJ Travel Service has achieved Nature Tourism certification for a range of tour products including; Jervis Bay day tour, Blue Mountains day tour, Farm day tour, and Hunter Valley day tour. Established in 2006, JJ Travel Service are specialists in personalised, flexible, small-group and private tours to Jervis Bay Day Tour, Blue Mountain One Day Tour, Farm Day Tour & Hunter Valley Resort. They cater specifically for Chinese tourists and provide Chinese speaking guides, claimed to be “the best, small-group Chinese day tours in Australia”. JJ Travel Service proudly state they are determined to provide value to customers in the high end luxury travel sector with their 5 star service guaranteed. Congratulations to Heritage Retreat for achieving Advanced Ecotourism certification. Heritage Retreat offers self-contained, luxury, boutique accommodation in the Hunter Valley, NSW, centred in the shire of Dungog between the vineyards of Cessnock and the beautiful, recreational Barrington Tops reserve. The property boasts heritage charm and modern flair with old-meets-new decor. Guests enjoy the relaxing, secluded environment with a range of activities on offer from a golf driving range to lawn games and outdoor checkers, or venturing out to choose from a wide variety of activities offered in the stunning Hunter Valley surrounds. For more information on Heritage Retreat or to book your next getaway, visit their website. To find out more about Advanced Ecotourism certification, click here. Congratulations to Cicada Lodge for achieving Ecotourism and ROC certification! Cicada Lodge is the Northern Territories’ latest eco-luxury resort. 300kms South of Darwin and only 32kms from the Katherine town centre, Cicada Lodge is located in the pristine wilderness area of Nitmiluk National Park surrounded by rocky cliffs and cascading waterfalls. The lodge is intrinsically involved with the Jawoyn people who are the traditional owners of the land. 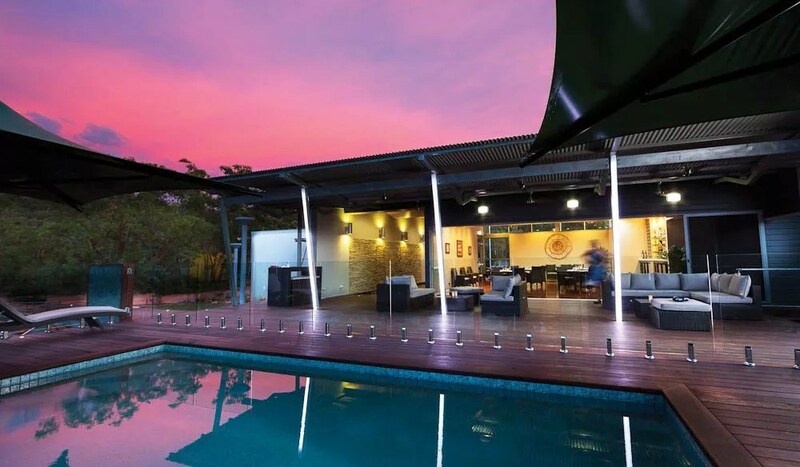 As a joint venture between the Jawoyn people and Indigenous Business People (IBA), Cicada Lodge ‘brings a new element of quality, service and authenticity’ to the Katherine region. With packages at Cicada Lodge covering everything from world class accommodation, adventure tours and a dining experience completely catered to showing off native Australian foods, you’ll be sure to find something to make your experience in the top end unforgettable.